I think that I may have found my summertime obsession. Berry Freeze (located in the Coolidge Corner section of Brookline) could be categorized as just another place serving the oh so popular tart frozen yogurt. There does seem to be a rash of them popping up all over the city. However, this isn’t just another place at all. This place is awesome. The first thing that makes this place awesome- it’s self serve-completely self serve. You choose your cup size, choose your flavor, and help your self to as much or as little as you want. 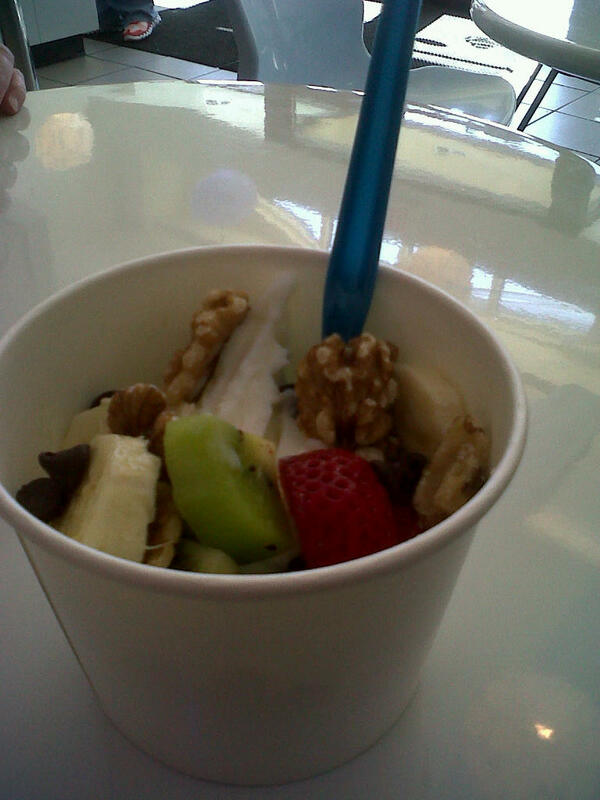 THEN-the best part in my opinion, you help yourself to toppings-and they have QUITE the selection. As many different varieties as you want, in the varying quantities you prefer-all your own decision. The second thing that makes this thing awesome- its all priced on weight- $.35 per ounce. Not a bad deal for you to help your self and compliment your flavor selection with the toppings you prefer. Finally, the third awesome thing- the yogurt is only 100 calories for 3.5 ounces. Those are some numbers I can deal with. My first experience at Berry Freeze, I helped myself to a small cup, selected coconut as my flavor choice and added a small twirl of yogurt to my cup. Then I helped myself to sliced kiwi fruit, bananas, strawberries, walnuts, and for a little decadence- a sprinkle of a few chocolate chips. The yogurt was extremely cold (great for those extremely hot summer days you know are on their way), and had great coconut flavor without seeming over done. The toppings were fresh and delicious-they even managed to keep the banana from turning brown! All in all this was a very tasty treat on one of the first summer like days of the spring. I can’t wait to return and try new flavor combinations! Oooh, LOVE a DIY froyo place. I'm a huge toppings person. I'm going to have to try it out soon . . . thanks for the heads up! Such a timely post! I haven't been to Berry Freeze yet, but I am on the prowl for some good, local ice cream and frozen yogurt spots - thanks for the heads up! Absolutely ladies!! It's a great spot and self serve was an awesome feature!! i've been meaning to check this place out. it's in my neighborhood. now i have even more incentive. thanks for your post. Thanks! Great to hear you had such a wonderful experience, can't wait to hear your feedback on different flavors and combinations. I just had my first smoothie from there the other day, and it was delicious, refreshing in the 100 degree heat, and only 3 bucks!